Please, see my extensive tutorial “Lenses – Beginnner’s Guide”. It should answer most of your questions about lenses. Among other things, it talks about how you can save a lot of money by buying used manual lenses, especially the Nikon (a great place to look for these lenses is eBay). Good lenses are important but some people put too much importance on having the best lenses. It is easy to overspend in this area, but if you’re smart and shop around, you can build up a nice assortment of lenses for a reasonable cost. Also, having a varied selection of lenses is more important than having lenses with the best specifications but fewer of them. One mistake I see filmmmakers make is to go for the super-fast lenses (i.e. large aperture – low f-stop number). Yes, it is nice to have a fast lens – because you can shoot with less light – but if you use a very large aperture, keeping your subjects in focus becomes a challenge. For example, I see filmmakers use very wide aperture on steadicam shots, and then get surprised that they cannot keep their actors in focus. I strongly recommend buying lenses with Canon’s EF mount, even if you don’t own a Canon camera at the moment. If you have a long career as a filmmaker, you’r unlikely to stick with one brand of cameras – you will most likely upgrade cameras, but not the lenses you own. The EF mount lenses are the easiest lenses to adapt. Of course, there are some native lenses that are a good buy too. For example, for Panasonic cameras, I really like the Panasonic Lumix G X Vario f/2.8 lenses. Speaking of native lenses, usually kit zoom lenses offer good value, so they are a good place to start your lens collection. For example, I really like the Sony E 16-50mm F3.5-5.6 OSS on my Sony a6500. Although the specs don’t seem impressive, this is the lens I use the most on this camera. It is small, just like the a6500 camera body, and I find this combo perfect for gimbals. Another advantage of using kit lenses is that they maximize the autofocus and image stabilization of your camera and lens. Whenever you adapt a lens from another brand, you invariably lose some of the AF and IS performance. 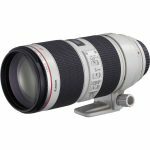 If your camera doesn’t come with a kit lens, or you can spend extra money, here are some really good zoom lenses. For Panasonic cameras, I really like the Panasonic Lumix G X Vario f/2.8 lenses, as I mentioned earlier. 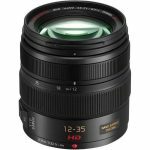 These zoom lenses come in 12-35mm and 35-100mm focal ranges. Also, you can choose between two generations. The second generation improves the image stabilization – it supports Dual I.S. 2 while the first generation supports in-body image stabilization up to Dual I.S. 1. In practical terms, though, the improvement is not significant, and since the older lenses are usually discounted, I think they offer more value. 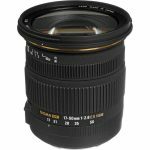 The next lens I recommend getting is a 50mm prime lens (full frame equivalent; the nifty fifty). 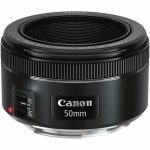 50mm lenses approximate the field of view of our eyes and are very versatile. Plus, with the prime lens, you will be able to shoot with less light and have a sharper image. Also, these lenses are generally not expensive, unless you go for a very fast lens. Once you have a solid native zoom and a nifty-fifty prime, you can take two very different routes, depending on the type of projects you make. If your work is primarily films and music videos, i.e. projects where you usually have control over the lighting and your subjects, then you should go for a kit of cinema lenses. Please go to “Film Industry Lenses” at the end of this article for more information. If your projects are run-and-gun, like documentaries, TV field reports, weddings, events (and also corporate), you don’t need as many lenses, but the ones you get need to be versatile and fast. Therefore, you should go for zoom lenses that cover a wide range of focal lengths, and that work well in low light. Filming in situations where you have little control means that you cannot change your lenses often, therefore versatility is crucial. This is a lot of money to spend on a lens, but, again, it’s a fast, versatile zoom. It really is a beautiful lens. Fortunately, here is a much more economical medium zoom lens that I personally own and use. It’s also fast and sharp, and with a good range. Last on my list would be a wide-angle lens, whether prime or zoom. I find them quite useful on music videos, and when shooting indoors on location (as opposed to a set) – the space can often be tight. Also, these lenses are usually fast, so they are useful when working with little light. Here is another fast short lens, but this one is also distortion free. Most wide-angle lenses make straight lines at the edges appear curved. That is not the case with this lens, and that is why you have to pay a premium for it. For general film work, you rarely need a lens longer than 200 mm (especially on a ASP-C or MFT sensor). When you work on films and music videos, you have control over the lighting, movement of actors, etc. This allows you to change lenses more often. Filmmakers who work in these situations usually opt for lenses with bigger, sharper glass elements. This way, they gain in image quality, although lose lens flexibility. Cinema lenses are available as zooms too, but they are very expensive. That is why primes are the more common choice. It is important to note that cinema lenses do not have autofocus. Instead, they have a physical ring that allows to use a traditional follow focus system, or wireless focus system, and gives a smooth pull for a great control over the iris (an aperture ring is usually also present). An example of great cinema lenses is the Rokinon Xeen line. However, these lenses are very expensive. I recommend getting a set of Rokinon Cine DS lenses, instead. Here‘s a video where I test and compare the Rokinon Cine DS and Xeen lenses. As I mentioned before, it is a good idea to get lenses in the EF lens mount, since you will be able to adapt them to almost any camera. 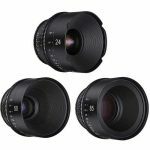 What is your opinion on the Veydra mini primes for Panasonic? 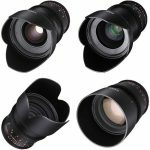 How is the image quality, durability and ease of use compared to the Rokinons? When first seeing videos about the Sony 18-135 f4 OSS lens I thought there would be a delay in zooming. In practice though I have found that the only time there is any delay is if you zoom with the camera off then turn it on. There is a second while the lens zooms to the desired range. Other than that its smooth sailing. I’ve used the Rokinon Cine DS lenses a lot and love them. Sure there are better lenses but it really is the best bang for the buck. Makes great images, light and easy to use. The Rokinon Cinema lenses are my go to. No matter the quality of your camera body, be it a T5i it a Blackmagic Ursa, Rokinon provides a clean, crisp, beautiful image that always looks good and very professional. I use almost only Voigländer Lenses with my Panasonic GH cameras. I try to use almost only the 25 mm to get a consistent look. The sharpnes and quality is amazing. 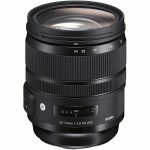 I have been using the Sigma 1.8 18 – 35mm Art lens with a Viltrox speed booster , so it’s like a 24mm to 55mm 1.2 lens on the GH5. The lens is very sharp , built like a tank and heavy , focus and zoom control is very smooth. The Viltrox 1.7 speed booster fits very well and auto focus, aperture and shutter can be controlled by the camera body just like native lenses. Besides the high quality of the lens I’ve noticed that lay people are impressed by it’s size. I use to use native lenses and nobody said ” wow that’s some camera ” but now they do. Never thought of it before but if you want to look professional , big lenses help. I have a Zhiyun Crane V2 stabilizer and the GH5 with the Sigma 18-35 is to long and heavy to balance , I have a Rokinon 12mm 2.0 for when I need the stabilizer . Today there are many great lenses and the one you have is probably good enough , unless your like me and just want to buy them all, well then do it. As other commenters have said above.. The Sigma 18-35mm F1.8 is my go to lens that hardly ever comes off the GH5 now days. Combined with the Viltrox EF-M2 low cost Speedbooster (see my Youtube Video at Karr Galaxy Studios channel), the GH5 with this speedbooster is a combination that can’t be beat. The image quality and the fact that on the GH5 the speedbooster results in an f1.2 lens with FF effective equivalent field of view of a 26mm to 50mm lens on the GH5. 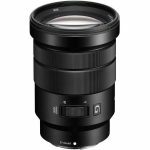 Pair this lens with the Sigma Art 50-100mm f1.8 (71mm to 142mm FF eq.) and you have a fantastic 2 lens kit that will cover most focal lengths and give you awesome low light in any shooting situation!